August 3 is National Watermelon Day. This is the perfect occasion to go on a picnic or throw a pool party and indulge yourself with sweet and tasty summer fruit. Watermelon is a vine-like plant which is believed to have originated in southern Africa. It is grown for its edible fruit with juicy, sweet flesh and a smooth hard rind. The flesh is typically red or pink but it can also be yellow, orange, or white. There are more than 1200 different varieties of watermelon different in shape and size. Watermelon has been cultivated in Egypt and India for millennia. Watermelons were introduced into Europe around the 10th century. In the 16th century, they were brought to America by European colonists and African slaves. Watermelons are over 90% water, they also contain about 6% sugar. They contain vitamin A, B-complex vitamins, vitamin C, potassium, phosphorus, magnesium, calcium, iron. 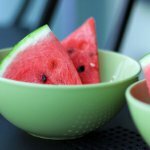 Watermelons are typically eaten plain but they can also be used in desserts (for example, fruit salads) and beverages, grilled, or mixed into condiments. To celebrate National Watermelon Day, have a slice of this delicious fruit. You can also make a pitcher of refreshing watermelon lemonade or a colorful fruit salad made with yellow and red watermelon.